Many investors use a combination position for options, such as put options as a form of insurance for existing stock positions. You can buy puts for stocks you own, as well as for those you don’t own because holding the underlying asset is not a requirement in the listed option markets. In addition to creating a risk graph for a single stock or option position, you can also create ones for combined positions. This comes in handy, giving you easy access to the reward profile for the position and, more importantly, its risk profile. 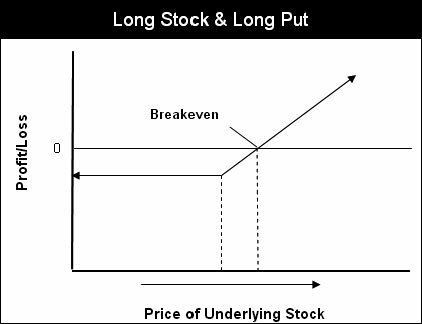 In each case, long stock is paired with a long put, a short call, or both to improve the risk and/or reward potential. Similar combination positions can be applied to a short stock position. You can hold a stock position and purchase options on that same stock to change the risk or reward profile for the stock, or you can hold option positions without holding a position in the underlying. After you formulate an outlook or identify a market trend, you can combine different strike prices and options to vary risk and reward. You can design risk graphs for combination positions by first drawing the risk graph for each individual position and then overlaying them. You then check to see if the risks or rewards for any one position provide a cap for the unlimited or limited-but-high risks or rewards for the other position. This is better understood through example. The figure displays the risk graph for a married put position, one that combines long stock and a long put for the same stock. This trade creates a risk-reward profile that is similar to a long call, once you account for the put premium in the breakeven price. By adding the put, you minimize losses for the stock. At the same time, your potential rewards remain unlimited after accounting for the new breakeven point.